I know none of us are anxious to have another church-wide election, but one will be necessary this fall. The purpose of this election will be to vote to change the constitution, thus completing the transition of our denomination that was started at the 2005 National Conference. You will be receiving lots of information about this election later in the year, but I just wanted to apprise you that it is coming. It’s interesting how we take things that are biblical and make them a buzzword for a while. Today, spiritual formation is in danger of becoming a buzzword in our church cluture. When I talk about spiritual formation, I think of Paul’s words about being conformed to the image of God’s son. In My Utmost for His Highest, Oswald Chambers asks, when you look in a mirror, do you see a reflection of Christ? In our churches, we need people to take on the image of Christ. People who talk like Christ, walk like Christ, live like Christ — and are, in fact, little Christs. (That term “little Christs” is from Martin Luther.) When you hear me talk about spiritual renewal or spiritual tranformation in the church, that’s what I’m talking about. I want to convince people that we need to begin to look like Jesus. The Holy Spirit is in the business of transforming us into the image of Christ…So I ask, how much more do I look like Christ today than I did yesterday? Gets convicting real quick! On January 25, Bishop Emeritus Paul Hirschy began a new job as a development officer at Huntington University. His primary responsibilities are to cultivate relationships and generate financial resources for the University. Hirschy will travel the tri-state area meeting with alumni and friends to share the Huntington University story. 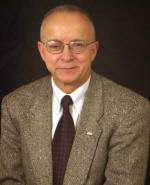 Hirschy served from 2001-2005 as bishop of the United Brethren in Christ Church, USA. Prior to that position, he was the director of the Department of Church Services for the United Brethren in Christ Church beginning in 1982. “I hope to serve Huntington University by making good contacts with people who believe in the University’s mission, and I plan to help build church and University relations through my extensive contacts with pastors and churches,” Hirschy said. Hirschy and his wife, Barb, a schoolteacher, attend College Park Church in Huntington, Ind. Mike Brown, pastor of the Franklin UB church in New Albany, Ohio, is currently looking for persons interested in joining a 10-day mission trip to the Philippines. Members of this team will participate in a week-long evangelistic crusade, working in partnership with the new Philippines National Conference. These crusades, held annually for the past 18 years, have consistently resulted in new churches being formed. Individuals with the following giftedness are needed: musicians, books, medical personnel, persons for testimonies, altar counselors, and miscellaneous helpers. This is a chance to be among the first North American UBs to visit and become acquainted with the new Philippines National Conference, which became a member UB conference in June 2005. For more information about the trip, contact Rev. Mike Brown at 614-855-1391 (church phone) or 614-855-3276 (home phone). If it is encouraging, let him encourage; if it is contributing to the needs of others, let him give generously; if it is leadership, let him govern diligently; if it is showing mercy, let him do it cheerfully. Romans 12 speaks about the grace of God given to us as His body so we mutually benefit each other. That is why we must work as a team for the common good. And here is a praise that illustrates that. The Willshire, OH, church, now called Praise Point, opened their new building on New Year’s Day. In December, at their old facility, they had 90-100 people average. This past Sunday, if a group of youth and their leaders who were out on retreat were counted in, they had over 200. They are making sudden leaps that they are scrambling to keep up with. In comes the team. They never functioned as a church of 200 before. They need help. We are working at assigning a coach to them who can help them figure out the decisions that have to be made, the processes that have to change, the steps to take to transition the congregation from a small to medium sized church, and the pitfalls to avoid. What a great problem! Please pray for them as they address these challenges and seek to have the Lord continue the new work He has begun there. Thanks again to all who participated in our first cluster leader training. Just having you rub shoulders in the same room for a day and a half was a blessing to watch. YOU are key to making a difference in the lives of those you lead. Please email me your cluster schedules as soon as possible. Pam and I would like to travel to be with you a time or two this year. If you want to do some demographic studies of your area, our Nazarene friends have a helpful tool at http://map.nazarene.org. Click on your state and if a Nazarene church is close by you can navigate around the site to get stats for your town. As you lead, remember that the operative word is KINGDOM and everything we do has to be assessed on how it is positively contributing to the building of that Kingdom, His Kingdom and not ours. Supporting you in prayer always! “End of the Spear” is a version of the story of the five missionaries killed in Ecuador by the Auca Indians in 1956. This great missions film opens in local theaters beginning January 20. Note that it is rated PG-13 due to some spearing scenes. About ten slots are still open for a mission trip to Poland this summer. It starts June 29 and ends July 11, 2006. The purpose is to work alongside UB endorsed missionaries Arek and Donna Delik (right) as they reach out to young people in Kutno, Poland, a city of 50,000. The event will involve teaching English as a second language to teenagers in a camp setting. It will cost $1700 per person. Donna Hollopeter will lead the group, and needs to know of your interest by March 1. Contact Donna by email. Abby Farmer (right), one of our newest endorsed missionaries, is leaving this month for Papua New Guinea, where she will teach missionary children. Abby is from the Blue Rock UB church in Waynesboro, Pa.
Angie Swanson, a member of First UB church in Findlay, Ohio, is extending her stay at Jamaica Bible College through July 2006. She has been teaching a variety of classes, has mentored a number of students, and has been involved in a local United Brethren church. Angie needs an additional $3000 in support to get her through July. Contact missions@ub.org if you’re able to help. Mike and Jennifer Burtnett and family (right), also new endorsed missionaries, left the staff of Hillsdale UB church (Hillsdale, Mich.) this month to join Wycliffe Bible Translators. They will serve at Wycliffe’s World Mobilization Center in Orlando, Florida. I have basically “bought in” to the Healthy Church concept that healthy churches grow and it is possible to establish criteria to describe a healthy church. However, I was a little uncomfortable with the fact that the arguments for are so pragmatic. I recently came across a book written way back in 2002, Discipled Warriors, by Chuck Lawless that is excellent. The sub-title is: “Growing Healthy Churches That Are Equipped For Spiritual Warfare.” In this book Lawless draws the argument that Church Health must be based on a theological foundation and then the principles build from that fundation. I found it to be an encouraging and challenging book. One you might want to add to your growing library of books and material about the Healthy Church. I for one, will continue to exhort our churches to consider taking necessary steps to becoming healthy congregations. It really doesn’t have anything to do with size. It has everything to do with being obedient to the call of God upon a local church and the fact that the enemy of our soul and the church will do everything he can do to distract us from our mission.